One of the most spectacular natural environments on the planet is also one of the most vulnerable, and if people are not careful, there is a good chance that it could be completely destroyed. 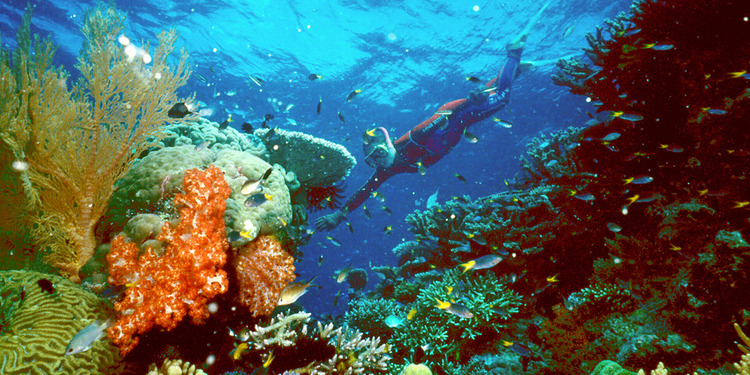 The Great Barrier Reef is located on the northeastern coast of Australia and consists of more than 3,860 different coral reefs. It is such a massive natural structure that it can be seen from space. It houses countless organisms and is a major attraction for tourism. It is the most biodiverse of UNESCO World Heritage Sites and the world's largest coral reef ecosystem. But like all coral reefs, it is susceptible to human activity, which means that it is in danger of dying. It's not just local activities like fishing and pollution that damage the corals that make up the Great Barrier Reef, even though they have harmful effects. The biggest threat to reef health, both off the coast of Australia and around the world, comes from the carbon dioxide emissions that cause climate change. The far-reaching consequences of reef loss are devastating, both for natural environments and for the people who depend on them. A recent study in the journal Nature Geosciences has said that the Great Barrier Reef has returned from near-death experience five times in the last 30,000 years. This shows that recovery is at least theoretically possible, but in these cases it took hundreds or thousands of years. Here's what happens to make the Great Barrier Reef so vulnerable.